While seething mobs converged around them, the Prophet Joseph and his brethren quietly submitted themselves to imprisonment in Carthage Jail. Now, as never before, audiences are invited to witness the events of the days preceding the martyrdom. Based on documents handed down through the generations, Carthage offers a glimpse into the turmoil and testimony of the men whose place in history was forever defined by what was to come—a jailer seeking to protect his charges, a governor caught between the persecuted and their persecutors, and a group of Saints whose faith and brotherhood stands as the ultimate witness of the restoration of the gospel of Jesus Christ. CARTHAGE Teaser from Ron Brough on Vimeo. Whenever Deseret Book releases a new DVD, I buy it. And I usually end up watching it that night. And that's exactly what I did with Carthage. 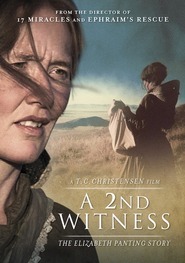 I was expecting this to be a continuing saga from the Joseph Smith film shown previously at the Joseph Smith Building. But that wasn't the case with Carthage. As much as I wanted to like the film, in the end, it didn't live up to expectations. The film quality and acting were significantly below par. Of course the story was interesting. Too bad it couldn't have been helped by just a little more work. There were a lot of things about this short movie that I really liked. I liked the way that Joseph Smith was portrayed in it. I thought the actor did a great job and it was fun to see how he would have interacted one on one with the people he was in the jail with, especially his brother Hyrum. Their time together in this one was really touching to me. I like that it shows Joseph, not only as a prophet, but as a man who cared about those around him, and as a man who liked a good joke whenever there was one to be had. I liked that it didn't end with what really happened to Joseph, it ends with him and Hyrum having a quite moment of prayer together. We all know what really happened to them, and it was tasteful to not show that part on film. I also like the part where the son of the jailer comes to Joseph to ask a question. His father is almost...hostile, but the son is actually afraid of the men because of the things he'd been hearing from the mob. I thought this was a sweet scene that was really well done. I liked the actors in this one. I thought they all did a good job of portraying their characters and trying to really "be" them. This whole movie takes place in the Carthage Jail. The whole point of view of it was interesting and I liked it a lot.